The VIRB exploits Garmin's GPS expertise, and it's well designed with a simple slide switch to start and stop recording. It arrives with a GoPro mount adapter, and the whole package has been well thought out, though it's only waterproof to 1m without the optional waterproof casing. The action camera market is starting to settle down, with a familiar formula of ultra wide-angle lens, ultra tough exterior and small size. Despite the recent explosion in the number of action cameras on the market, it's rare to see a device with a new feature outside of improvements in core technologies such as resolution and frame rates. But Garmin is a big name in GPS, producing location-tracking car and personal navigation devices used by many outdoor enthusiasts. Perhaps it's no surprise, then, that Garmin has entered the action camera market with a camera that incorporates GPS technology. The Virb blends the action camera functions with GPS technology to give you a bit of both in a careful balance. 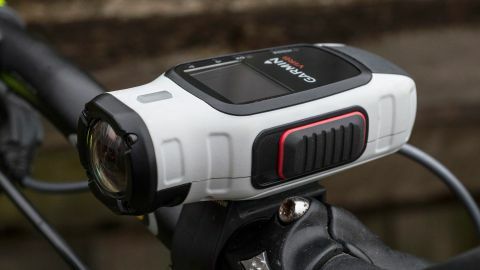 It offers a maximum video resolution of 1080p at 30 frames per second and it also offers GPS data recording, though not navigation or route planning. This simple two-position switch is the Virb's start/stop recording control. Up against rivals in both the action camera and off road GPS markets, the Virb's features seem decidedly light, with limited high quality video or navigation options. Really, it offers just the basics, but it balances these features in a usable way that will appeal to everyday users, and make the experience of using this action camera that much better for it. It has a small but perfectly visible screen, image stabilisation and a huge three hours of battery life. That's all well and good, but is GPS really a feature that will help the Garmin Virb make it mark in an increasingly crowded action cam market? The Virb's design stands out. It is at the moment the only camera that has gone for a bright white outer casing. Initial worries that this will become marked and grubby are quickly realised, but with a quick wipe down after a ride that white glow is quickly recovered. In fact, though, a little dusting of dirt actually adds to the appeal of the design. The Virb's white case does show up dirt, but it wipes clean easily enough. Design wise, the Garmin is like the Drift Ghost-S and goes for a mixture of the bullet and box design, which makes it slightly larger than many of its rivals. However, this additional size does make it easy to handle, with direct access buttons that cover the side of the case. The small screen is contrasty and although relatively low resolution when compared with smartphones, it's easy to see in bright sunlight and enables quick settings changes when needed. A design feature that really stands out is the slide switch on the side that is used to start and stop recording. This is very similar to the control on the iON Air Pro 3, though without the vibration indicator. It enables quick operation and you know if the camera is recording simple because of the position of this switch. This saves you having to visually check if you're filming, which is useful when the Virb is mounted on a helmet. This slide switch automatically activates the camera so there is no need to power up before recording. The Virb follows standard action cam design, with a fixed focal length ultra-wide-angle lens. The front features the usual small fixed action camera lens that gives footage the wide-angle fisheye look. Unlike many other manufacturers, Garmin offers a couple of additional settings for lens correction and image stabilisation. While the image stabilisation is effective, I found that the Lens Correction could cause wavy distortion within the footage when mounted on a bike and used off road. The image stabilisation however was very effective when used handheld or in smoother road situations. Unfortunately, the image stabilisation cannot be used without Lens Correction. The small screen enables you to easily navigate settings, or you can use it as a live view. This is generally a luxury in the world of action cameras, but on the Garmin it feels like a sensible addition. Down the side of the camera are four buttons. The power on button doubles as the mode button once on, then the navigation buttons enable you to switch between screens and confirm settings. Navigation is quite simple and finding and changing modes and settings is very straightforward with a good responsive feel even when wearing gloves. The USB and HDMI ports are covered by a rubber flap, but the Virb Elite is waterproof only to a depth of 1m. On the back is a rubber flap under which are hidden the camera's connectors, including USB and HDMI. This flap should be good enough to protect the camera from a typical heavy downpour, but although Garmin says that the camera is waterproof to 1m, I'd want to have it in the more secure waterproof housing before it was submerged. On the underside of the camera is a hatch for the battery and card slots. This follows exactly the same design as many of the Garmin handheld devices and as long as you have a decent capacity micro SD card – 32GB, for example – there should really be no reason to access this during your three hours of recording time. The memory card is stored under the battery on the Virb's underside.